VANCOUVER, Dec. 10, 2018 /CNW/ - Mirasol Resources Ltd. (TSX-V: MRZ, OTCPK: MRZLF) (the "Company" or "Mirasol") is pleased to report that it has entered into a non-binding heads of agreement (the "HoA") with Newcrest International Pty Limited, a wholly owned subsidiary of Newcrest Mining Limited ("NCM"), for an Option to Farm-in on the Gorbea High-Sulfidation Epithermal (HSE) gold projects (the "Project") in Chile, and is terminating the previously announced (news release February 26, 2018) NCM option agreement on the Zeus Project (Figure 1). The Gorbea HoA is subject to NCM completing its due diligence review of the claims and the parties executing a formal option agreement (the "Agreement") on or before January 15, 2019 or such later date as may be agreed. The key terms of the Agreement having been settled, the parties will execute the final Agreement once due diligence has been completed. Mirasol has granted an exclusivity period to NCM to complete these conditions. 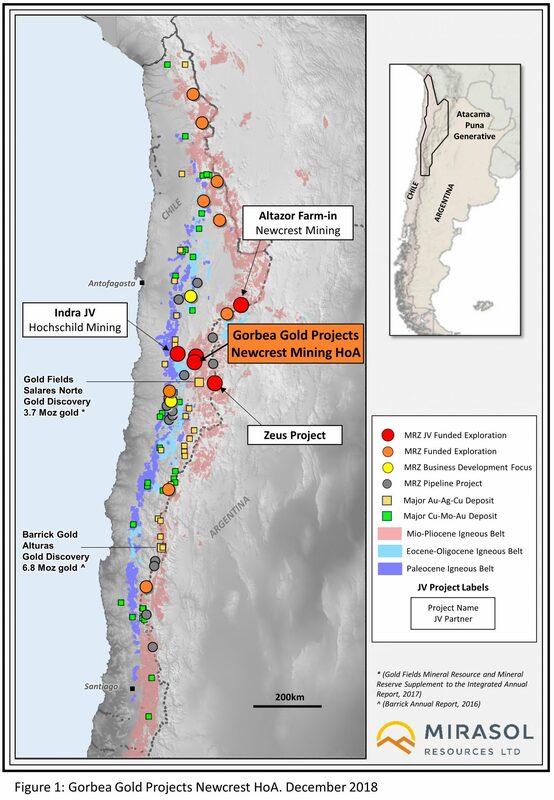 The Gorbea Project comprises a package of projects totaling 26,684 ha, including the Atlas Au+Ag and the Titan Au (Cu) projects, located in the Mio-Pliocene age mineral belt of northern Chile. The Gorbea properties were subject to a previous joint venture that was terminated in April 2018, after the partner had incurred exploration expenditures in excess of US$ 8 million. The exploration identified a significant body of HSE gold mineralization at the Atlas project, which returned a drill intercept of 114 m grading 1.07 g/t Au, including 36 m grading 2.49 g/t Au (news release September 11, 2017). Mirasol is undertaking an integrated analysis of the extensive Atlas database and will provide a technical update on the project in the near term. Under the terms of the HoA, NCM will have the right to acquire, in multiple stages, up to 75% of the Gorbea Project by completing a series of exploration and development milestones and making staged option payments to Mirasol. NCM has committed to spend a minimum of US$4 million and complete a minimum of 3,000 m of drilling over an initial 18-month period, subject to drill permitting timelines. NCM has assembled a Chilean based exploration team with significant HSE exploration experience and will operate the Gorbea exploration program. Stephen Nano, CEO of Mirasol, stated that "we are pleased to again be partnering with the Newcrest team to explore some of our prospective Mio-Pliocene belt projects for district scale gold deposits. Newcrest has allocated a combined US$7.3 million in separate agreements, for the exploration of Mirasol's Gorbea and Altazor projects over the next 12 to 18 months. We are working with Newcrest to advance the permitting process for the Atlas project in the Gorbea package, with the objective of drilling during the southern hemisphere summer." Stage 4: After completion of Stage 3, Mirasol can elect to: (i) contribute its proportionate share (25%) of further development expenditures, (ii) exercise a one-time equity conversion option to convert up to 10% of its equity into a NSR royalty at a rate of 2.5% equity per 0.5% NSR royalty (max 2% NSR royalty) and then contribute funding to advance the Company's remaining project equity interest; or (iii) dilute. The rate of dilution royalty for Mirasol (up to 2% and triggered upon dilution of its interest to 10%) will be adjusted based on the percentage royalty acquired as part of the equity conversion option. NCM will hold a 0.5% NSR buyback right at fair market value exercisable on the conversion royalty or the dilution royalty. After NCM has met the minimum commitment in the Option phase, NCM may terminate at any time without liability. In the event that NCM should complete Stage 1, but elect not to proceed to Stage 2, then NCM's 51% interest shall be adjusted to a 49% interest. In the event that NCM completes Stage 2, but elects not to proceed to Stage 3, then NCM's 65% interest shall be adjusted to a 60% interest and the parties may agree to halt further exploration or continue and contribute in proportion to their interests or be diluted. The HoA also contains other customary terms including extension rights to increase the duration of each stage 1, 2 or 3 for cash payments to Mirasol and pre-emptive rights provisions should either party elect to sell its interest in the Project. The companies have also agreed to the early termination of the Zeus Option to Farm-in Agreement that was previously announced on February 26, 2018. Under the terms of the Zeus agreement, NCM had a minimum spend commitment of US$1.5 million in the first 18-month exploration program. The balance of the minimum commitment expenditures for Zeus that have not yet been incurred, will be applied towards the $4 million initial commitment for the Gorbea Project. NCM has also agreed to a US$200,000 early termination payment to Mirasol. Upon termination, NCM will have no retained rights in the Zeus project. Mirasol wishes to thank NCM for its investment that has advanced exploration of the Zeus project. Mirasol will report the exploration results from last season's Zeus exploration program shortly. Mirasol has initiated the business development process to identify a new joint venture partner to continue exploration at the Zeus project during the 2019 southern hemisphere summer season. Mirasol maintains the view that Zeus is a prospective, underexplored, Au+Ag project located in prospective geological setting, 43km East of the Goldfields Salares Norte HSE project2 (of 3.7 Moz Au at 4.89 g/t Au and 49.5 Moz Ag contained within 23.3 Mt) in the Mio-Pliocene belt of Northern Chile. Newcrest is one of the world's largest gold mining companies, operating five mines in Australia, the Asia - Pacific and Africa regions. Newcrest has extensive experience developing and operating successful underground and open pit mines in culturally and geographically diverse environments. Newcrest seeks to identify and secure large mineral districts, or provinces, in order to establish long term mining operations. Mirasol is a leading project generation company focused upon the discovery, and development of economic precious metal and copper deposits via a hybrid Joint Venture and self funded drilling business model. Strategic Joint Ventures with major precious metal producers have enabled Mirasol to maintain a tight share structure while advancing its priority projects that are focused in high-potential regions of Chile and Argentina. Mirasol employs an integrated generative and on-ground exploration approach, combining leading-edge technologies and with experienced exploration geoscientists to maximize the potential for discovery. Mirasol is in a strong financial position and has a significant portfolio of exploration projects located within the Tertiary Age Mineral belts of Chile and the Jurassic age Au+Ag district of Santa Cruz Province Argentina. Mirasol applies industry standard exploration sampling methodologies and techniques. All geochemical rock and drill samples are collected under the supervision of the company's geologists in accordance with industry practice. Geochemical assays are obtained and reported under a quality assurance and quality control (QA/QC) program. Samples are dispatched to an ISO 9001:2008 accredited laboratory in Chile for analysis. Assay results from surface rock, channel, trench, and drill core samples may be higher, lower or similar to results obtained from surface samples due to surficial oxidation and enrichment processes or due to natural geological grade variations in the primary mineralization. Gold Fields. (2017). Integrated Annual Report 2017.